Yep, and there`s two more hid in there somewheres. After about a 4 or 5 hour simmer, I`ll remove the bay leaves. You ever try making file from sassafras leaves? Boy.. that Brunswick Stew is teasing me. It's done got dark on me,,, time to start some dinner. I have some sirloins cut up with some mushrooms, onions, thyme, S&P and a can of beef consomme in a frying pan on a single burner. Gotta render down quite a bit before ready. Wow!!! That is a winner right there!!!! Got us a really happy Dawg! 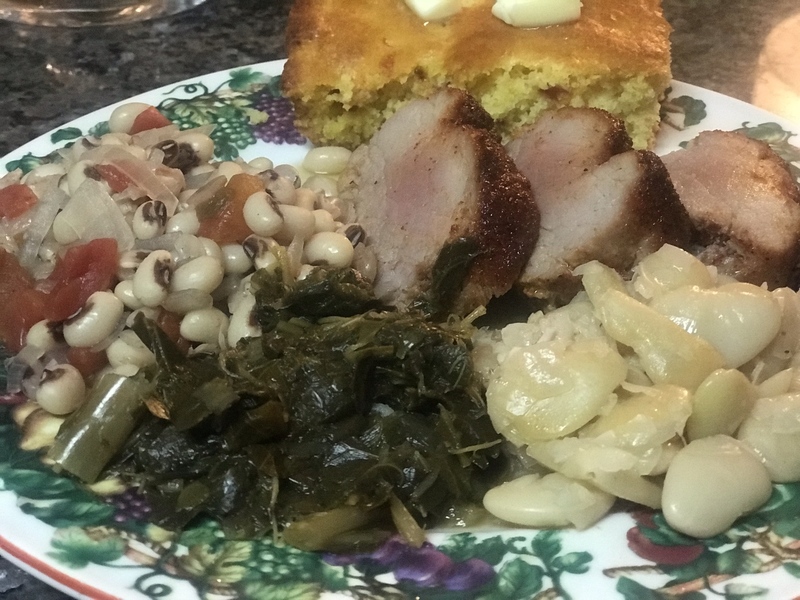 Sunday dinna here......pork tenderloin, limas, peas, collards and hopped up cornbread. Shrimp & good cocktail sauce are about the best appetizer on this planet. Yers is looking really good. I"m betting that's gonna be some tender beefy goodness right there !!!! Good lord Dub! What a plate!! Yep. It`s good for thickening stews. Ain`t no shortage of sassafras trees around here. I even have volunteers on my fence rows. Same here. They're in the same family as bay leaves. Chili werent bad at all. Looks good guys ! I didn’t take plates pics but I smoked two 5lb pork butts, made collards, Cole slaw and Tater salad. Have no idea how I posted the same picture twice in the same post? Your slippin, may have to put you up soon. I got dibs on that rifle. Wow!! Are you sure Washtub's granny didn't cook that fine mess of goodness!! That is one fine,, fine plate right there!! !